To mark the 60th Anniversary of the Dams Raid carried out by No 617 Squadron on 16/17 May 1943 equipped with specially modified Lancasters fitted with Barnes Wallis' remarkable bouncing bomb we are releasing what will be the most popular cover we have so far issued, with stunning artwork and superb signatures. The top part of the artwork shows Lancaster 'AJ-A' flown by Squadron Leader H Young about to prepare to make his attack, while the lower half of the artwork shows Wing Commander Guy Gibson and his crew boarding Lancaster AJ-G. The raid was a great success and a great moral boast for the Allied war effort and immortalised in the film 'the Dam Busters' released in the mid-1950s. 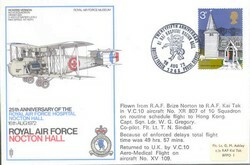 Each cover bears a British Forces Post Office special handstamp, dated the 16/17 May 2003, which shows the Lancaster AJ-G which Wing Commander Guy Gibson flew, and commemorates the 60th Anniversary of the Dams Raid. Furthermore the covers have been double flown in a Tornado of No 617 Squadron and also in VC 10, XV102, named 'Guy Gibson VC' of No 10 Squadron. 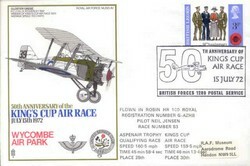 This cover bears the 2.00 GBP Isle of Man Dambuster stamp with artwork by Robert Taylor cancelled on first day of issue. As a Sergeant, Ray Grayston took part in 'Operation Chastise' as the Flight Engineer on Pilot Officer Les Knight's Lancaster ED912, 'AJ-N', which attacked the Eder Dam. On 15/16 September 1943 during a raid on the Dortmund-Ems Canal, flying low-level in poor visibility their aircraft hit trees and lost the two port engines and crew were forced to bale out. Grayston became a POW and was sent to Stalag Luft III.